Classic Lapsang Souchong Zheng Shan Xiao Zhong Black Tea – traditional dry pine wood fire smoke-dried “Bohea” black tea of highest (“nonpareil”) quality grade. The Chen family tends a number of Wuyishan tea gardens that have been in their possession for 3 generations now. Our Classic Lapsang Souchong comes from their Bohea tea garden near the village of Tong Mu. 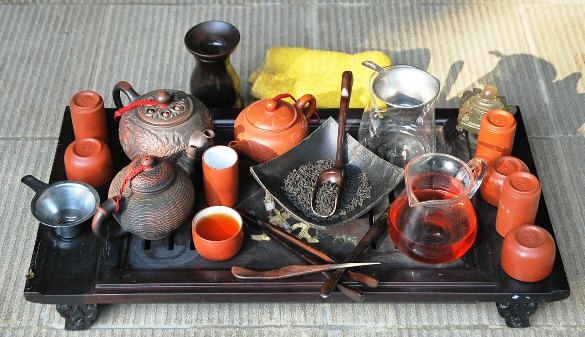 It produces a bright red tea liquor with a unique taste pattern, composing of a finely balanced, harmonious combination of the mild, but rich black tea basis and the artisan smoke-drying process. For detailed information and illustration please refer to the product description below. According to legend, the discovery of Lapsang Souchong tea, in the West today one of the most popular Chinese teas, owes to mere coincidence. At the times of the Qing dynasty, China’s last imperial dynasty lasting from 1644-1912, the inhabitants of the village Tongmu (chin. “Tong Mu Guan” 桐木关) at famous Wuyi mountain in the Chinese province of Fujian were once forced by odd circumstances to dry their tea leaves much quicker than usual. To achieve this, they decided to heat the tea leaves over the hearth fire of burning pine wood. The resulting strong smoke aroma and flavor proved to greatly camouflage the less desirable taste features of the rather low quality tea leaves. Moreover, the smoke aroma and flavor made this tea something special, i.e. a specialty, which quickly established as a popular variant among Westerners. In China, however, Lapsang Souchong was long considered a “poor-man’s-tea”. So, to produce the truly original Lapsang Souchong, preferably minor quality tea leaves were smoke-dried over fires of fresh-cut pine wood. Actually, a possible meaning of “Souchong” is 4th and 5th leaf. The scene underwent drastic change, when Tongmu village in 1979 was given Word Heritage status by the UNESCO. As a consequence, the value of cropland within the borders of the UNESCO protection zone multiplied within no time. In turn, this made the cultivation of lower quality tea unprofitable and effected a general shift towards the cultivation of higher quality tea. Part of the set of restrictions coming with the World Heritage Site status was a strict ban on any pesticide use. This meant an additional contribution to higher selectivity of crop and processing quality in Tong Mu and within the UNESCO protection zone. Then again, the ban provides a desirable health and environment-friendly warranty from the perspective of aware consumers and environmentalists. The production of Lapsang tea in Tongmu village has since taken 2 directions. On the one hand, the traditional processing pattern is maintained and enhanced by the use of higher leaf grades. Concomitant with more decent levels of smoking, this string culminates in the best quality of this tea available, our Classic Lapsang “Zheng Shan Xiao Zhong”. Then, a new branch, Lapsang Jin Jun Mei, omits all smoking, but focuses on superior or even pure buds picking standard and producing a top grade conventional black tea instead. In China, authentic versions of both teas are rather expensive today. Accordingly, cheaper versions of Lapsang Souchong comingout of Tong Mu will usually be made from leaves originating from outside the UNESCO production zone. Other than Lapsang Zheng Shan Xiao Zhong, which in favor of a more harmonious and altogether improved taste result today are smoke-dried with seasoned, fully dried pine wood, lower quality Lapsang Souchong might still be dried over fire made of fresh-cut pine wood or even pine resin. Until today, everything is done by hand in the Chen family’s tea gardens and tea factory. At this, the artisan process stretches from picking through processing to the final Bohea black tea or Wuyi yancha oolong. Our Classic Lapsang Souchong Zheng Shan Xiao Zhong produces a bright red tea liquor with a unique taste pattern. This composes of a finely balanced, harmonious combination of the mild, but rich black tea basis and the artisan smoke-drying process. In an imaginary center, both elements meet to produce the sweet Longan taste that is characteristic for classic Lapsang Souchong. A high note of fresh mint rounds up the composition and melts in the mouth with the smoke flavor to something completely new and unique. 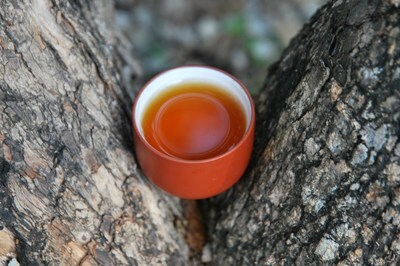 To prepare our Classic Lapsang Zheng Shan Xiao Zhong Nonpareil we recommend a dosage of 2 grams per 100ml hot water. As for infusion temperature, use boiling hot water (100°C). Let infuse 3-4 minutes for a first infusion. Given 5 minutes for a second infusion, the same will be just about as worthy as the first. And we’d certainly encourage tea lovers to experiment with dosage and timing in order to make the best of their tea according to individual preferences. This high quality Lapsang Souchong is really strong and full-bodied. Its smoky and sweet aroma combined with the complicated taste make this tea outstanding from others in my tea collection. With the boiling water and around 3 g of tea leaves in my Gaiwan, I can enjoy this tea for 4-5 times. Although its strong aroma may not familiar with the beginner, this Lapsang souchong has no bitter taste at all.